We have recently received brand new American Style Joysticks, and whilst new, we are treating them as seconds as the microswitch blades need to be adjusted in order to function correctly. We have approximately 100 units left are have reduced the price to $4.50 each to clear stock. Our latest Facebook giveaway is well underway and this time we are going to be giving one lucky winner a $100 spare parts voucher. This voucher can be spent on any of our spare parts stock, whether it be locks, coin mechs, game boards, artwork, push buttons or joysticks. Are you looking for an affordable joystick with durability and effortless design? We have the solution for you! 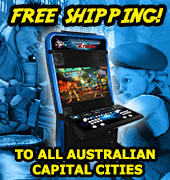 The American Style Joystick is now only $8.95 (RRP $16.95) and is in stock, ready for immediate shipment! The American Style Joystick is perfect for users looking to update their joysticks, replace a faulty one or start their own MAME project. Starting a DIY project, replacing faulty parts or after some new push buttons? At Highway Entertainment, we have you covered. We have arcade push buttons with microswitches for only $1.50 each. These push buttons come in a range of colours including black, blue, green, red, white and yellow, giving you more choice and allowing you to choose the colour scheme of your own design. Our buttons are in stock and ready for immediate shipment, so why not purchase some right now and get those fingers mashing! We have now received a shipment of degaussing wands for CRT monitors. Breathe life back in to your old arcade or computer screen by reducing the magnetic field of the monitor and correcting any colour problems caused by any electrical interference. Purchase any game header, player instruction and game sticker set during May or June, and receive another header free to the same value. All our arcade machine posters are now online available for sale. Ideal as a feature in your games room, or to advertising the latest game in your arcade centre. All stocks of our arcade and gaming push buttons are now on sale with most discounted over 50%, up to 90%. Wide collection of original buttons from Japan, Australia, Korea, and China. Connect this Internet ready USB coin mech to your computer via your computers USB port. An intelligent multi-coin selector that can memorise and recognise 5 different types of coins with different signals; it can be connected to a computer by an RS-232 interface or USB adapter. We are pleased to announce we are expanding our spare parts department, and will now be offering a wide range of pinball spare parts. 1000 pieces of assorted coin mechs including the C120, C220 and MS100, are now available through Highway Entertainment at clearance prices. Until stocks run out, the coin mechs are selling for US$25, however, the minimum order for this price is 100 pieces. All are ex Europe used mechs with a 3% warranty. A number of headers, player instructions and cabinet stickers have now been added to the spare parts section of the Highway Entertainment website. 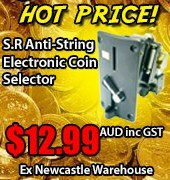 We have over 300+ used (as new) condition Mars Cashlow electronic coin mechanisms available for immediate shipment.